The latest two episodes of the original Sailor Moon anime have been added to Hulu and Neon Alley. As with every Monday two new episodes, subbed by Viz, are added online. 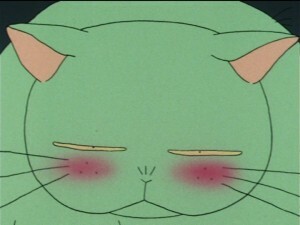 This week we have episodes 31 and 32 which are two of the funniest episodes of the series. In episode 31, Love and Chased: Luna’s Worst Day Ever, we meet Rhett Butler, a fat alley cat who falls in love with Luna. The search for the last Rainbow Crystal is on and leads Zoisite and the Sailor Guardians to the house of a young girl, but it’s her cat who’s actually the final Rainbow Crystal carrier! Rhett Butler choses to protect Luna from all of the stray cats in Tokyo. Their adventures take them deep into the sewers and ultimately back to the surface where Rhett Butler turns into the monster Bakene who is still able to keep his wits and protect Luna despite his monster status, a feat that none of the human Rainbow Crystal carriers were able to do. Like many of the romances early in the series, this one is short lived and the reasons are simply because there are other plans for some characters. Artemis will be showing up in just a few episodes and so there’s just no room to keep Rhett Bulter around beyond the scope of this episode, but in the final moments it’s quite clear that Luna and Rhett Butler shared a great love. In episode 32, Umino’s Resolve: I’ll Protect Naru, we see Umino’s protective side as he suits up and becomes Tuxedo Umino Kamen. 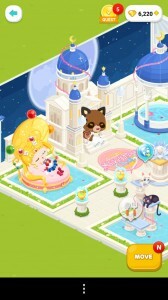 Now that Usagi has new friends it’s long overdue that Naru and Umino hook up with each other so that we don’t have to feel bad about how neglected they are! 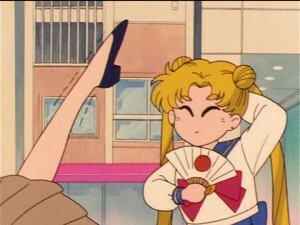 Umino is of course completely socially awkward and has no idea how to win over Naru so he asks Usagi who describes what she is into as qualities attributed to Tuxedo Mask. 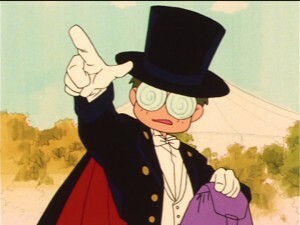 Umino naturally decides to dress as Tuxedo Mask and protect Naru, which is met with some apprehension but is ultimately fairly successfull. They go on a date together to see Red Man, and when Zoisite misses Naru he ends up making a monster of the Power Ranger style character who attacks everyone in site, forcing Umino to step up as protector. Once again Umino isn’t terribly effective, but his heart is in the right place, and that’s what counts. This is one romance that isn’t about to get sidetracked by some inconvenient destiny as Umino and Naru are set to have a long and happy relationship. 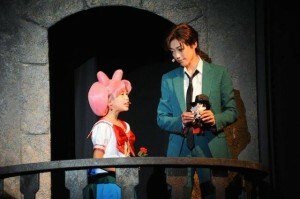 Today, August 21st 2014, marks the first performance of the new Sailor Moon musical, Petite Étrangère, in Japan. This new musical covers the second story arc, covering the first appearance of Chibiusa, fighting with the Black Moon Clan and traveling to the future city of Crystal Tokyo to meet Sailor Pluto, Neo Queen Serenity and King Endymion. The musical will be running from August 21st to the 31st in Tokyo and then from September 7th to the 9th in Osaka. 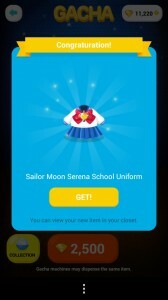 With the premiere we have gotten some new information about merchandise for the musical and the first international airing of a Sailor Moon musical. Fans must all be wanting to see the musical for themselves but unless they’re in Japan this isn’t possible yet. Fansubbing group Miss Dream has mentioned that they will be subtitling the webcast version during the weekend of September 6th. 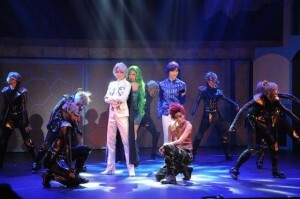 Indeed Niconico will have a live webcast of the musical on September 7th. 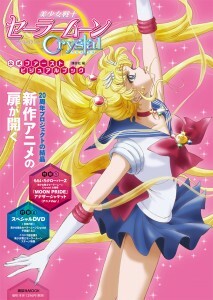 News on the Sailor Moon official site has announced that the DVD of the musical will be released on January 28th 2015. Those who pre-order the upcoming DVD will get some bonuses including 5 cards and an exclusive DVD jacket for the first Sailor Moon Musical, La Reconquista, with art made by Naoko Takeuchi, the creator of the Sailor Moon manga. This is not new art but a mix of existing images. The cards contain images of the new manga cover and the DVD jacket is a reuse of the original cover of the 4th volume of the Sailor Moon Manga. 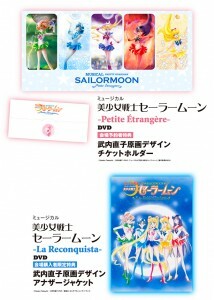 The Sailor Moon Petite Étrangère DVD will cost 7800 yen (about $75 US) and yes, we once again only have a DVD and not a Blu-Ray release of the musical. I was very disappointed with the video quality of the Sailor Moon La Reconquista DVD release and there doesn’t seem to be any indication that your $75 plus shipping costs will be getting you anything better this time around. There are no real specifics on special features at this time, though comparable features to the La Reconquista DVD should be expected. It was also announced today that the Sailor Moon Petite Étrangère musical will be playing in Shanghai China in Janaury of 2015. 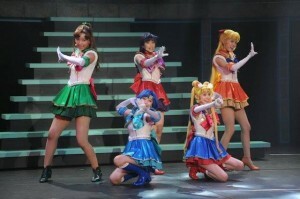 This is the first time any of the Sailor Moon musicals has played outside of Japan. And here’s a cool little Easter Egg that may or may not have been intentional. Tuxedo Mask wearing a Canadian Tuxedo as noted by @el_Ramses on Twitter! 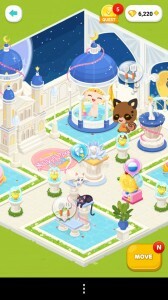 Keep reading for more images from the musical or find more on the Moon Sticks and SOS Sailor Moon‘s Facebook pages. I’ll have more thoughts on the actual musical once I get a chance to actually see it! 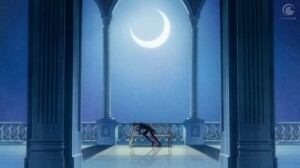 The two latest episodes of the original Sailor Moon anime have been added to Hulu and Neon Alley. As with every Monday Viz adds two new episodes of the series with English subtitles. This week we have episodes 29 and 30 as the search for all of the Rainbow Crystals continues. The major theme for these episodes is relationships! 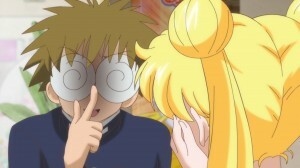 In episode 29, Total Chaos: the Messy Love Rectangle, Usagi and Makoto are devastated to learn that Motoki has a girlfriend, Reika. 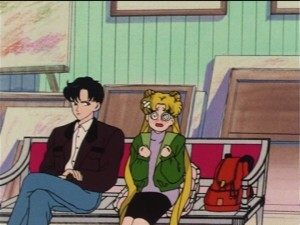 Since it’s still early in the series Usagi hasn’t figured out that Mamoru is Tuxedo Mask so she’s still fawning over Motoki while Makoto is reminded of her old boyfriend. 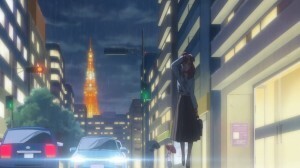 The Makoto/Motoki coupling in the anime continues throughout the first season as he’s used by the DD Girls to try to trick her when they go to the North Pole. 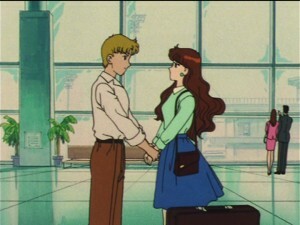 In the live action series this relationship is more important as it’s ultimately insinuated that they are to be married after Usagi and Mamoru tie the knot. 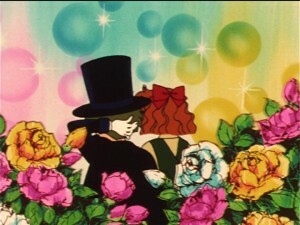 This episode also features a nice romantic scene between Kunzite and Zoisite. 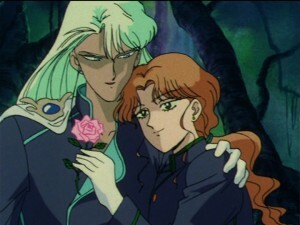 These lovers were a male/female couple in the dub as Zoisite’s gender was swapped while here in the original subtitled version we see their relationship as it was intended, a strong love between two men. 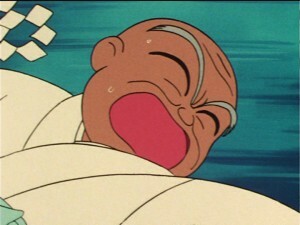 The art in this episode is particularly interesting, as there are many cool animation tricks showing super deformed characters and hidden frames that aren’t always that obvious, including the kind of racist portrayal of Usagi shown below. In episode 30, Grandpa Loses Control: Rei in Danger, we are introduced to Yuuichirou who shows up at Rei’s shrine and is immediately smitten with her. 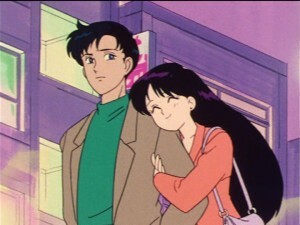 Though Rei and Mamoru’s relationship is well established at this point the end of that is near, thanks to pesky destiny, so a romantic interest for her is found in Yuuchirou. He’s a bit of a bumbling idiot but has a good heart and cares about her. 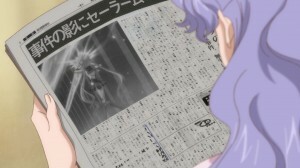 We also see Rei’s Grandpa showcased in this episode as he plays host to another of the Rainbow Crystals. Rei’s Grandpa is romantically linked with every young girl to visit the Hikawa Shrine because he’s a pervert! Enjoy the romances this week because next week is pure comedy with two of the funniest episodes of the series. 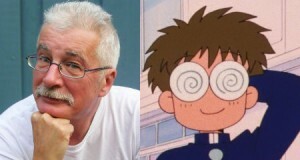 Roland Parliament, who supplied the voice of Melvin and was the voice director for the first 65 episodes of the DIC dub of the Sailor Moon anime, will once again be appearing at Unplugged Expo at the Chestnut Conference Centre in downtown Toronto September 27th and 28th. 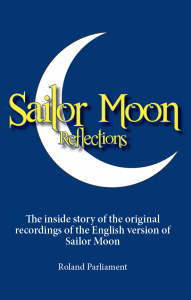 Roland Parliament will be promoting his upcoming book, Sailor Moon Reflections: The inside story of the original recordings of the English version of Sailor Moon. This book was originally announced at Unplugged Expo last year at the Sailor Moon 20th Anniversary Voice Actor Panel which we posted on our site. As voice director and a voice actor for the series he gained a ton of insight into the recording of the show and will be sharing stories and photos of the behind the scenes moments recording Sailor Moon. 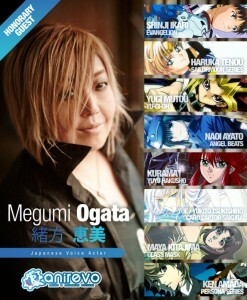 You can pre-order the book from the official web site. You can also check out Roland Parliament in Parliament Funkadelic, the latest episode of the Anime News Network Podcast ANNCast, in which he talks about the book and his time on the show. Set your alarms! 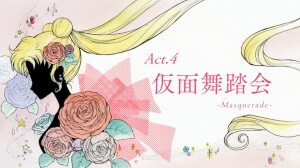 The 4th episode of Sailor Moon Crystal, Act 4: Masquerade Dance Party, will be available online streaming starting August 16th at 7pm Japan Standard Time. This is 6am Eastern Standard Time and 3am Pacific Standard Time. You can watch the episode on Crunchyroll, Hulu or Niconico. This episode has the Sailor Guardians, Tuxedo Mask and the Dark Kingdom crashing a masquerade party in order to investigate a gem which may be the Silver Crystal. Once again we follow a story straight from the manga as was the case for the previous three episodes. 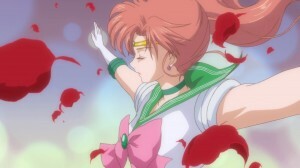 The two latest episodes of the original Sailor Moon anime have been added to Hulu and Neon Alley this morning. Every Monday two new episodes, in Japanese and subbed in English by Viz, are added to Hulu. This week we have episodes 27 and 28 as the race to get all of the Rainbow Crystals heats up! Episode 27, Crushing On Ami: the Boy Who Can See the Future, has Ami befriending a boy named Ryo Urawa who can see the future! 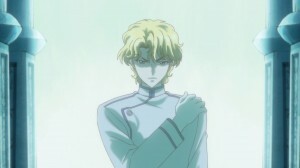 Because of his gift he’s able to challenge her at exams and can also see predict that he’s a Rainbow Crystal carrier and that Ami is Sailor Mercury! 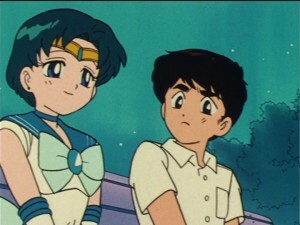 This early romantic interest for Sailor Mercury is one that fans have always liked to imagine continuing, even though Ami is clearly more well suited to hook up with Shingo in the future! 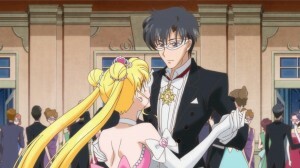 Ami isn’t the only one to have a romantic interest in this episode as we have a brief look at one of the many dates that take place between Mamoru and Rei, a lovely couple who’s relationship will soon be interrupted by pesky destiny. Episode 28, The Painting of Love: Usagi and Mamoru Get Closer, introduces us to an artist Yumemi Yumemo who paints images that represent true events from the Silver Millennium. 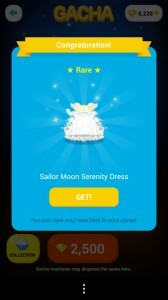 These images are coming to her because she is yet another Rainbow Crystal carrier. 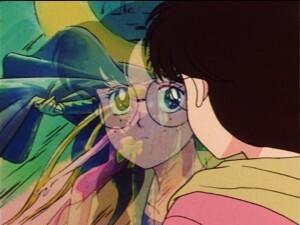 She choses Mamoru and Usagi as her models because they rightfully remind her of Endymion and Serenity who have been appearing to her in visions. 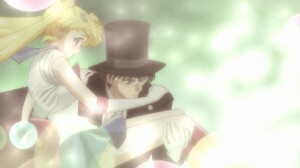 Things heat up a little between Mamoru and Usagi, who justifiably feels guilty for her feelings because of Mamoru’s relationship with Rei. Buy the first half of season 1 on DVD and Blu-Ray this November.